There have been big strides in publicly out LGBTQ representation over the last few editions of the Olympics, and now at Pyeongchang 2018 an openly gay man has won a gold medal – the first time in Winter Olympic history. And he is a Canadian. Openly gay figure skater Eric Radford, 33, of Balmertown, Ontario and his partner Meagan Duhamel performed first and second in the free skate and short program, respectively, of figure skating’s team event. Meagan Duhamel & Eric Radford (Team Canada) figure skating to “Hometown Glory” at the #Olympics! Overall with their combined scores, Canada won gold in the team event, with other members of the winning team consisting of Gabrielle Daleman, Patrick Chan, Kaetlyn Osmond, and power duo Tessa Virtue and Scott Moir. The silver medal went to the Olympic Athletes Representing Russia while the bronze medal was won by the United States, which also had an openly gay athlete in the team event. Adam Rippon, who placed third for the US in the men’s free program during the team event, is the first openly gay man to ever win a bronze medal. Conversely, the first openly gay athlete to win a gold medal in the Summer Olympics was Australian diver Matthew Mitcham at Beijing 2008. But why does all of this still matter in 2018? Well, high profile, successful athletes who are open about their sexuality help break down stereotypes about LGBTQ individuals in sport and serve as a powerful inspiration to athletes around the world who are still in the closet. 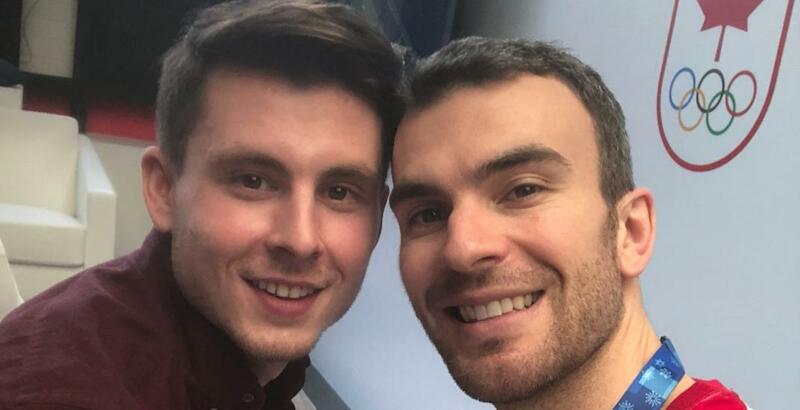 Radford made his sexual orientation public in an interview with Out Sports in 2014, and just last year he publicly announced his engagement to Spanish ice dancer Luis Fenero. “A big part was just feeling completely comfortable in own skin, in my life and in my skating. An opportunity presented itself when the Canadian Figure Skating Association announced a program to focus on LGBT issues in the sport,” he told the Ottawa Citizen. But a recent multi-nation study found that homophobia in sport still remains a significant problem, although Canadian sports culture was ranked as the most inclusive and progressive of six English-speaking nations – ahead of Australia, New Zealand, Ireland, United Kingdom, and the United States. Canada’s top-echelon institutional sports progressiveness with supporting LGBTQ athletes is openly evident at Pyeongchang, where the Canadian Olympic Committee’s Canada House also doubles as a Pride House for all athletes around the world. The concept of having a Pride House at an Olympics began at Vancouver 2010. As well, Canadians also have the most positive perception of LGBTQ individuals in sport, and adult Canadian gay men were the most likely to be open about their sexuality. However, homophobia is still prevalent in Canadian sports overall. Canada trails in other areas of the study, as it has the highest rate of bullying and physical assault of gay men. LGBTQ athletes, especially those in team sports, often feel they have to keep a major part of their life invisible and secret over fears of rejection, prejudice, and discrimination. Approximately nine out of ten youth who identify as gay or lesbian say they are not open about their sexuality with other members of their team, and 66% said they would feel unsafe in a spectator area of an event if they were out of the closet. This, of course, was particularly the case at Sochi 2014. LGBTQ issues were front and centre in the lead up to Sochi due to the international controversy over deeply entrenched homophobia not only in Russian society but also within Russia’s institutions. According to Out Sports, a total of 14 publicly out athletes – from nine countries – are competing at Pyeongchang, making it a record for the Winter Games.